These are timing checks for asynchronous signals similar to the setup and hold checks. 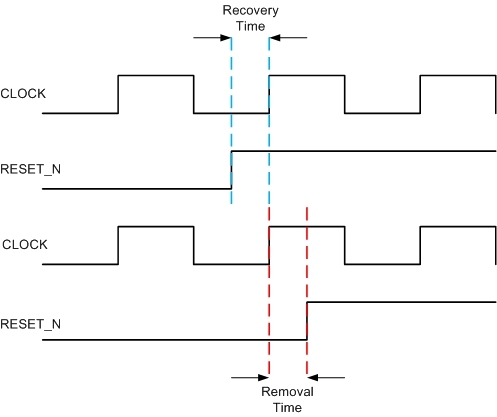 Recovery time is the minimum amount of time required between the release of an asynchronous signal from the active state to the next active clock edge. Example: The time between the reset and clock transitions for a flip-flop. If the active edge occurs too soon after the release of the reset, the state of the flip-flop can be unknown. Removal time specifies the minimum amount of time between an active clock edge and the release of an asynchronous control signal.